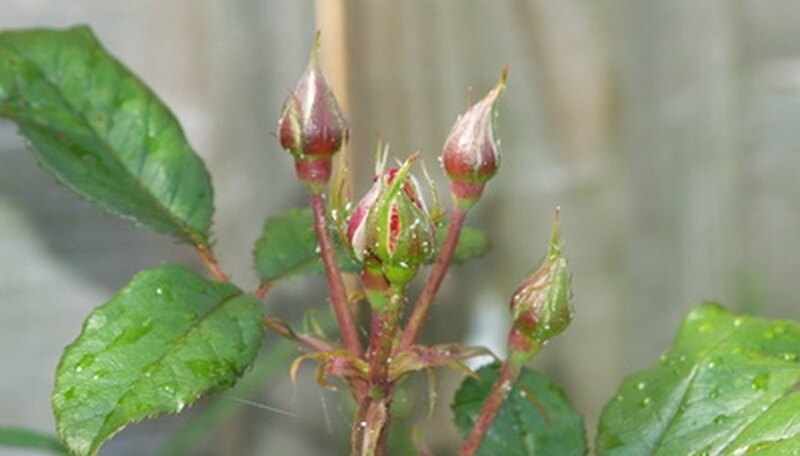 Common garden pests seem to love roses, devouring their leaves and ruining the buds. Commercial pesticides can rid your rose garden of these pests, but also kill beneficial insects and can harm the environment and animals such as birds. Homemade soap-based insecticide rose spray avoids this problem by killing only soft-bodied pests, and leaving beneficial insects like ladybugs untouched. Used properly, homemade insecticide will clear all types of pests from your roses, keeping them healthy and blooming. Add two tablespoons of dish washing liquid to one gallon of water. Stir well, mixing the dish washing soap in completely while creating as few suds as possible. Mix in a teaspoon of cooking oil. The oil is not necessary to kill the pests, but it helps spread the spray and lets it cling better to the leaves and bugs. Pour the soap mixture into a spray bottle. Spray the rose plants with the mixture, making sure to cover all areas, especially the undersides of the leaves where pests like to hide. Rinse the plant by spraying it with fresh water three to four hours after application of the soap spray to avoid any damage to the plant. Spray the plants with an insecticide soap. Fill a gallon jug with water and add 2 tbsp. of liquid soap and 2 tbsp. of food-grade oil. Shake well to mix. Apply the insecticidal soap to the entire plant with a spray bottle. Saturate the plant, concentrating on the under sides of each leaf. Saturate a cotton ball or soft cotton cloth, if you prefer, and wipe down each leaf individually. Place whitefly traps into the plant's soil to attract whiteflies away from your plants. Whiteflies become trapped on the sticky surface, unable to escape. Replace the whitefly traps as needed. Spray the plants with insecticidal soap every other day for four to five weeks. Doing so kills of hatching whitefly larvae and prevents reinfestation. Pests commonly infest fruit trees and can include fruit flies, plant bugs, coddling moths, fruit moths, leaf rollers, borers and aphids. Slugs are also common pests. These pests can be prevented with nets or deterrent sprays. Some fruit trees need to be protected before they blossom, while others need it after. Most fruit trees that become infected with a disease get it from a certain fungus or bacteria. There are several types of fruit tree diseases, so it is important to get it diagnosed properly based on the symptoms and time of year the fruit tree falls ill. These diseases may include things such as scabs or blight. You can successfully treat about half of these fruit tree diseases with preventative measures and treatments, but some diseases can completely kill a tree. 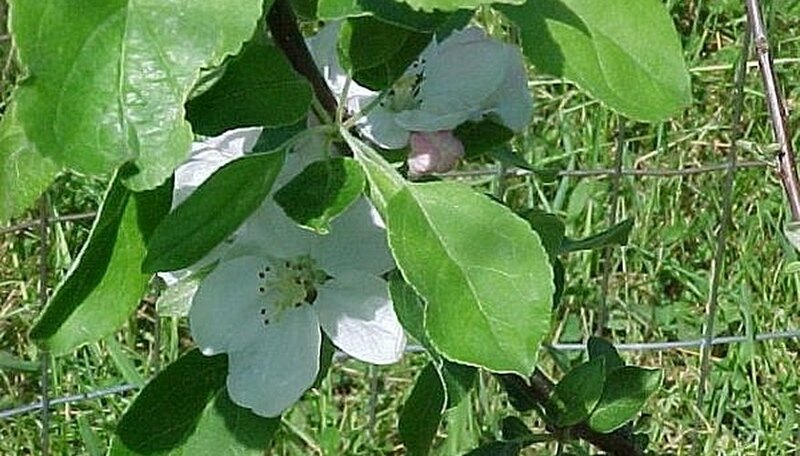 Common diseases include apple scab, black knots on cherry trees and fire blight on pear trees. Some animals think fruit tastes good, just like humans do. These include flying foxes, flying squirrels, squirrels and mice. These pests can bore holes into trees, gnaw on branches and early growth, and create homes in the trees so they are the ones getting the majority of the fruit. You can prevent these pests from accessing fruit with nets, or by planting the tree away from other trees with outstretched branches, or by encircling the trunk with several feet of mesh wire. You can begin by flushing the little beasts out where you can see them. Mix up some dish soap along with water. You only need the same amount you use to wash dishes with, one or two squirts of soap to 2 gallons of water. This should either kill or force the bugs and insects to the surface. If you are unable to identify what the insects are then bag up a few to take into the home improvement store with you. Time for treatment includes finding the right plan with no over kill. If you go over board you could kill off all the good bugs that keep your grass healthy. Sometimes all it will take is applying dish soap and water across the yard and other times you will need an insecticide to kill the bugs. Make sure you read all the directions on the commercial chemicals before applying them. You can use homemade, organic, or even commercial forms of pesticides. Be sure to walk backwards away from the sprayed area when applying. You might cover your shoes with the stuff and track it into the house which could harm children or pets. Keep checking the lawn and retreat if necessary. Treating for larva and eggs is 10 times easier then trying to kill off adult pests so don't go too long without checking your lawn. With any luck we will all be running bare foot through long healthy grass very soon. Flowering perennials native to Northeastern Europe and Asia, mums (chrysanthemums) produce fluffy, brightly colored flowers, many of which look similar to dahlia blooms. Besides being valued for their blossoms, mums are cultivated for their roots, which secret a substance that kills soil nematodes. Hardy mums can be grown in different types of soils, as long as they're well drained. Mums will generally survive with little attention in full sun locations in the garden. They are somewhat frost hardy. 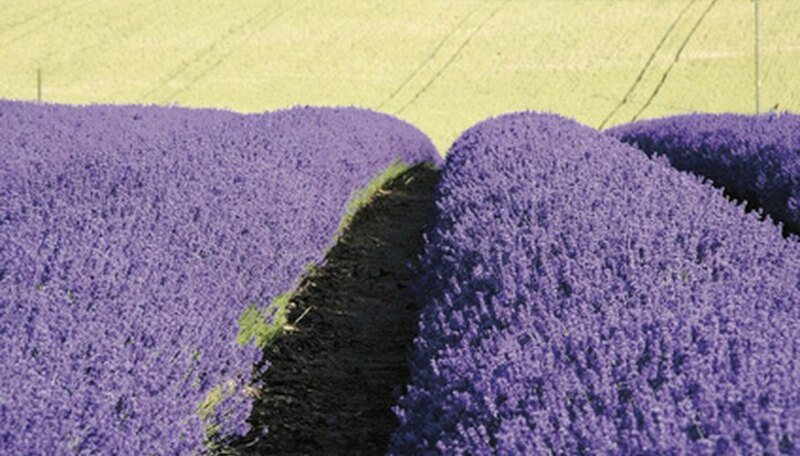 Gardeners cultivate many of the 39 species of lavender (Lavandula) in warm climates. Most lavender plants produce small blooms in shades of purple, although some have white, blue or slightly gray flowers. Lavender has a strong aroma that's attractive to humans but unattractive to common garden pests such as rabbits and deer. Common lavender (Lavandula angustifolia), also called English lavender, is a top seller that thrives in full sun and well-drained soils. Take dried lavender in the house to ward off clothing moths. Marigolds (Tagates erecta) require little maintenance. Gardeners cherish them for their blooms, which range in color from pale yellow to deep orange, and their ability to ward off pests. 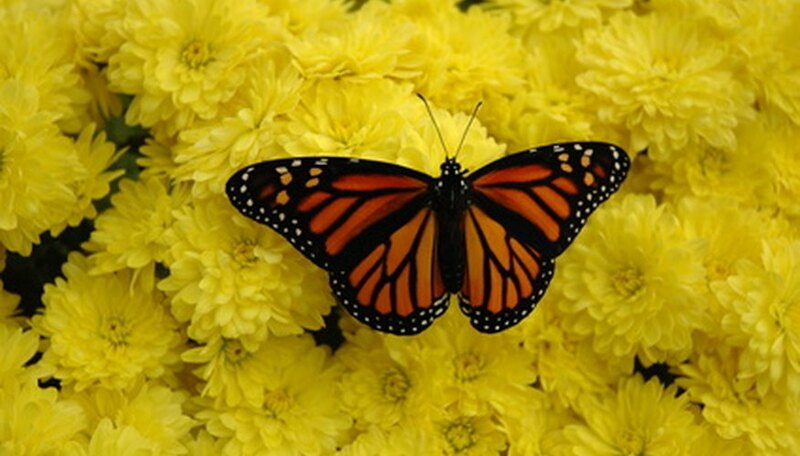 Marigolds possess a musky odor that makes them unappealing to many insects. 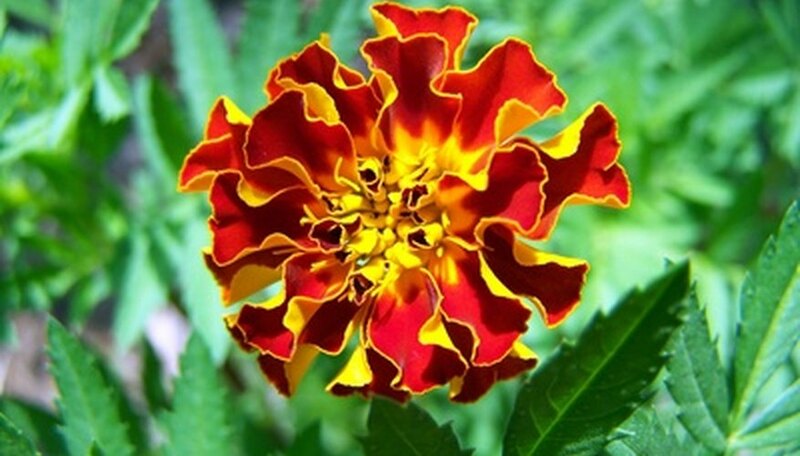 Native to Mexico, marigolds love full sunlight. These colorful annuals require little tending as long as they are placed in a sunny location with moist, well drained soil. Try non-chemical solutions to combat many types of insect pests. Predatory insects, such as lady beetles, lacewings and spiders, feed on pests without damaging garden crops. 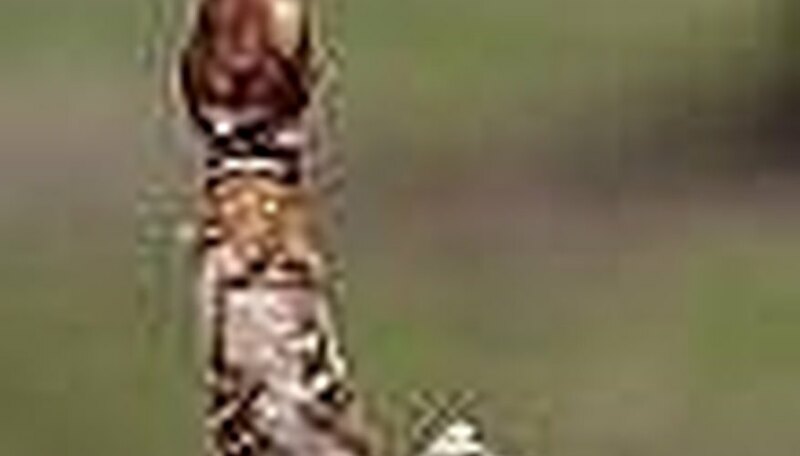 Sticky traps capture flying pests like whiteflies. If you do use chemical pesticides, follow all instructions on the label. Rotate your crops every year to avoid insect infestations. Various types of pests prefer certain varieties of plants and remain in the soil to await the next generation of their preferred food. Crop rotation disrupts their cycle by depriving them of their preferred diet. Keep dead vegetation cleared from your garden to reduce breeding grounds for pests and diseases. Control fungus in your garden and lawn by ensuring air circulation and sunlight around garden plants. Fungus thrives on dark and dampness. Examine compost for mildew, insects and insect eggs before placing it in your garden or yard. Rotting compost can introduce mold spores and insects to your garden and contaminated compost should be discarded. You can purchase sterile compost from your local garden center or landscape supplier to avoid contamination. Check the roots and stems of plants for the appearance of fleshy white masses--a sign of a bacterial disease called "crown gall." This disease commonly attacks roses, pear trees, plum trees and raspberry plants. Pull out the entire root systems of affected plants to ensure complete removal of diseased vegetation. Keep pruning equipment and other garden tools as sterile as possible to avoid spreading possible infections among healthy plants. Use a spray to protect fruit trees from insects and pests. Mix one cup vegetable oil and 2 tablespoons of Ivory soap together before combining with one gallon of water. Place in a spray bottle. Add a small amount of lime sulfur to this mixture and apply while the tree is dormant, shaking well while applying. DO NOT apply once the tree has begun to bud as this could kill the tree. After the tree begins to bud, follow up with dustings of Diatomaceous earth. I use an old turkey baster to apply the DE to the bark of the tree. It's very important to remember NOT to spray or dust the tree once it has flowered, until the fruit has set. 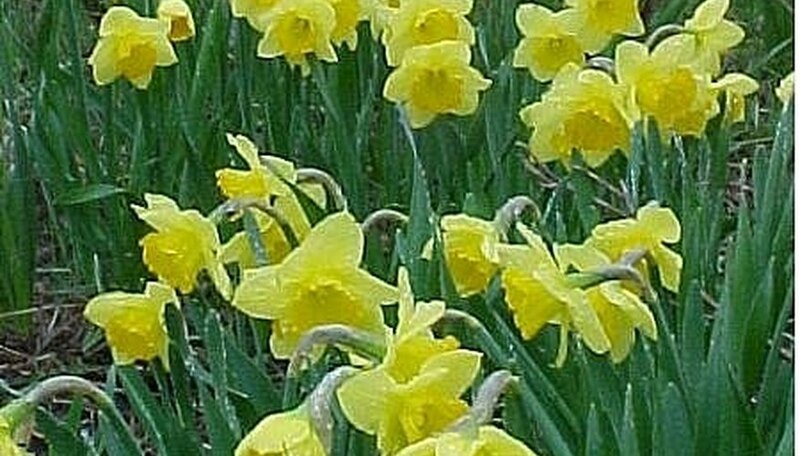 To prevent deer and small animals from munching on your trees, plant daffodils around the base. The deer and rabbits will stay away as long as the leaves are still thriving. After flowers appear, mix together 1 cup of cider vinegar, 1 cup sugar and 1 cup water and a banana peel. Cut a hole in a gallon milk jug and add mixture. Hang it on the tree. This will attract and trap any miscellaneous pests and help protect the fruit on your trees. I recommend changing this mixture once every week or so, depending on your climate. Break up clods of earth with a hoe or tiller in the area you’re treating for nematodes well in advance of the time you intend to plant. Rake out clumps, sticks and other debris. Moisten the area with a garden hose. Do not soak it. Cover the area with a sheet of clear plastic. Tuck the edges of the plastic into the soil and secure them with stakes. Drape another sheet of plastic over the first. The stakes should hold the plastic a few inches above the first sheet. Make sure the edges of the second sheet reach the ground, and secure them with additional stakes. 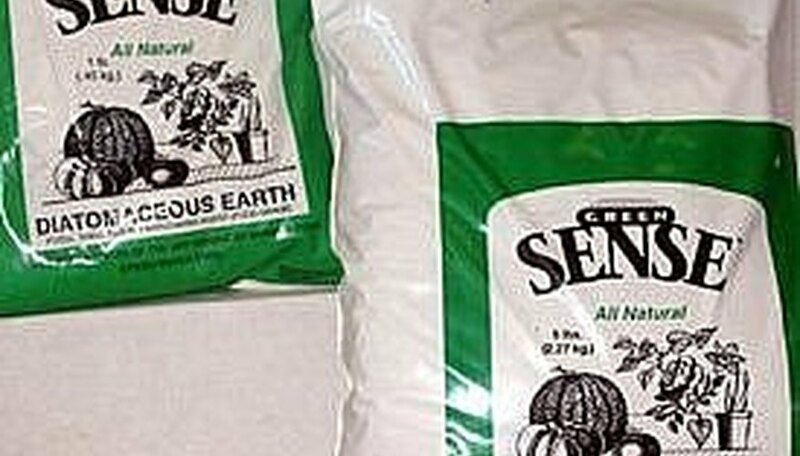 Leave the clear plastic on the soil for at least four weeks or as long as six weeks. Remove the plastic sheeting just before you plant. Measure and dig a 6-inch wide border completely around the tree's well. The optimal digging distance is 3 feet from the tree's base. Dig the well down about 1 foot for a solid foundation. Mix up the concrete as instructed on the bag in the wheel barrel. Fill the border 9 inches with concrete. Press the bricks into the concrete so that slight grooves are formed. Mix up the mortar as instructed on the bag in the wheel barrel. Scoop some mortar into a mortar bag with a small shovel. Pipe the mortar between the bricks. Kill thrips, spider mites, fungus gnats, aphids and ants with insecticidal soap. Spray the plant and any insects trailing away from the plant with the soap every few days until the insects are gone. Use insecticidal oil for mealybugs. These pests repel insecticidal soap, but insecticidal oil will suffocate them. Use it once a week until the insects have disappeared. Use rubbing alcohol to kill hard-bodied insects that aren't eradicated by soap or oil. Apply rubbing alcohol sparingly. It is not safe for consumption. Remove the top layer of soil and replace it with fresh soil if larvae or more insects continue to appear. Getting rid of the soil should remove the eggs from your plant before they have time to hatch. Spray especially fragile herbs, such as basil, with a gentle stream of water before using any other treatment. This may remove flying bugs like gnats and whiteflies. Pick off slugs and snails from your herb plants by hand at night. If that doesn’t work, use diatomaceous earth or a copper snail barrier. Walk through your garden every day and keep a watchful eye out for pests. Ants crawling up stems, leaves sporting blackened spots, and plants wilting frequently can tell you that insects or fungal diseases have arrived. Put insect traps and monitors such as yellow sticky bars in the garden and check them weekly. Grow vulnerable vegetables under floating row covers and keep a garden calendar to note seasonal and repeat problems. Observe any damage to plants on your garden walk, then look to see what's causing it. Turn leaves over to see webs underneath and scratch in the soil for caterpillars. Control the first pests you see by hand: Stomp or squish bugs, and pluck sickly leaves off the plant. Squeamish? You can pluck and drown insects in a jar of bleach. Use only organic pest controls for bigger or chronic problems. Become familiar with organic pesticides: insecticidal soap, oil sprays, pyrethrins, rotenone, and garlic or red pepper sprays. Spray or dust only the affected plants and repeat as directed on the label or recipe (when mixing your own). Spray or dust only when bees aren't working. Use parasitic insects to combat your garden's pests whenever possible - look for mixtures of Bacillus that infest common caterpillars. Encourage beneficial insects by planting a diversity of flowers and herbs that attract them. Stop trying to control the pests when the cure overwhelms your time or the plant's worthiness for your garden. Change your expectations and live with some damage, or take out the sick plants and grow something else. Place a bar of soap in a container of water. Do this at night before you go to bed. Remove the bar of soap from the water in the morning when you wake up. Some of the soap will have dissolved in the water. Add the corn oil to the soapy water. Pour the mixture into a spray bottle and shake it up. Spray the mixture all over your plants to remove the pests. This will kill the pests without harming the plant.